Okay, okay so I completely failed at blogging at the nationals. Truth is I was having a bit too much fun! Castle Cove showed all 70 odd boats how to run a great Moth event, with all the volunteers putting in a huge effort making us feel welcome with bacon sarnies galore, the most massive bbq I’ve ever seen and some top notch racing to boot. The Moth fleet over here has really come along in the last few years with the spread of abilities really tightening up. I think a lot of this is down to just how sailable the boats are now, letting people crack on and learn to race the boat rather than worrying about keeping it in the water! Reliability has also come on hugely, with big Friday seeing winds over 25 knots and barely any epoxy or grinding to be seen or heard. I had a very mixed few days which started with a big lack of upwind abilities. I was really struggling to get any fullness out of my 16 upwind (plus side, downwinds we’re veeery fast!) and was losing up more than I was gaining down and with the top 30 all being capable Moth sailors meant it was a lot harder to get yourself back in the game. The windy day went a lot better than I expected with no problems downwind, but my overpowered sail was really causing trouble leading me to get the saw out on my prodder overnight! Saturday saw me back on it a bit more with a bit more all round pace. I bought a used Raptor from Team Ireland (thanks Rory!) on Saturday night and rigged it up with Gio’s CST Elite3 and suddenly could go upwind again having my best result of the week in 7th. Unfortunately this followed with my worst race of the week where I couldn’t do anything right and had to wipe out avoiding traffic in the leeward gate. All 5 of the new Rockets made it down to the 70 boat Nationals down in Weymouth last week for 4 days of full on racing in everything from marginal foiling to full on 25 knot winds. It’s clear that the UK fleet has really stepped up a gear in the last season with the top of the fleet running very professional campaigns and testing multiple mast and sail combinations. Top of Rocket Racing was Cookie finishing in 12th. James Phare ran Rocket foils on his Ninja and posted some great top 10 results on the breezey day. Matt Ponsford took the top under 21 spot and posted a solid top-half of the fleet result despite only having taken delivery of his boat 2 weeks earlier. All of the boats had great downwind speed and plenty of depth and regularly able to gybe inside others and make better vmg. Cookie experimented with a Raptor sail on the final day and was back on the pace upwind. 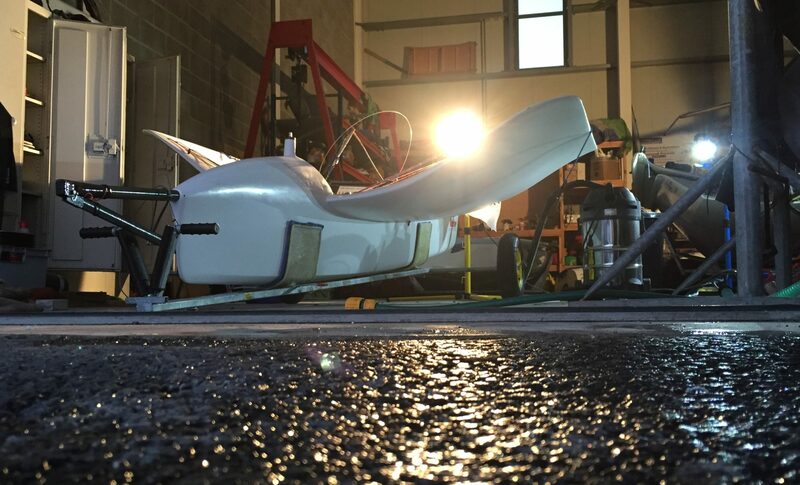 We’ve been working on feedback from Team Ninja to beef up parts of the boat, including controls, foils and torsional stiffness and it’s testament to all the years of Moth development that we suffered no breakages with the exception of Cookie’s Prodder which made a bid for freedom from his silly rod rigging. With the nationals now out of the way there is still a good season of open events to get to and the next one for Mike is the Torbay regatta weekend.